Sarah Corbett here asking my fellow craftivists (that’s you!) for your advice, solidarity & help pleeeeease. So you might have noticed from my NYC themed images on Instagram and excited tweets that I am finally having a holiday after over a year and heading to New York City for 10 days on 10th May with 2 brilliant friends (who are also craftivistas woop woop!). I really feel I need to get away, breathe, rest and reflect on what’s happened over the last few years. I’m excited to have time to go to galleries, talks, workshops, read some books and cool magazines, wander around the park, go to some craft shops, craft for fun & hang out with my awesome mates. But why I am really blogging is because I’ve decided to stay (after my friends go home on 20th May) until 10th June & I want to get your thoughts on an idea. My big (and super scary!) 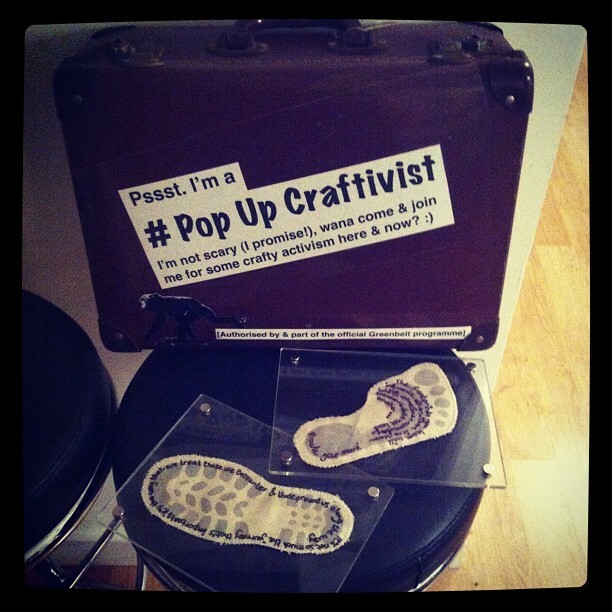 idea I keep thinking about is bringing our #popupcraftivist suitcase with me to NYC and sit in Union Square one Saturday or Sunday afternoon in June before I leave, for a few hours with either #imapiece jigsaw kits, footprints project (see below image) or other craftivism projects & a blanket and humbly hope people want to join me. I could promote the time, place & activity beforehand encouraging people to come join me in some crafty activism or/& have a chat about craftivism, it’s benefits people find for themselves as makers, viewers and in the activism world. What do you think? Should I do it? What craftivism project should I focus on? Do you think people will come? Can you help me promote it online and through any contacts you have? Is there anything else I should do in NYC whilst I am there to help me learn more that will help me with running the Craftivist Collective & inspire new ideas? 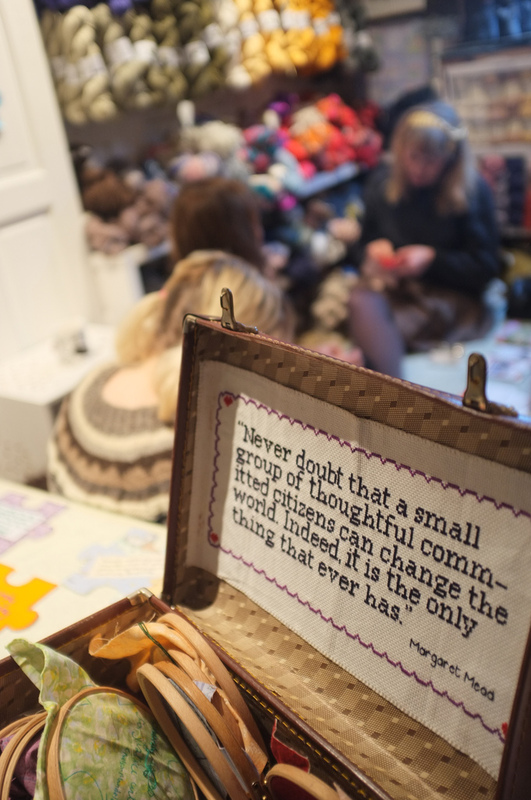 Is there anyone you think I should ask to meet for a coffee or cake and discuss craft & craftivism with, working together or just learning from each others discussion? I could give a workshop somewhere (I’ve contacted Trade School NYC to see if they would find it useful and interested for me to do a workshop)- do you know any places that might want me to do deliver a workshop? I could do some talks or discussions (I’m in talks with The New School University who are interested in me doing a talk & discussion with their students) – do you know any organisations, institutions or events this might be useful in? I want to use my time in NYC as productively as possible and be as useful as possible for this craftivism movement whilst I am there. It might be that I just write, think, stitch and take time to do that alone or it might be that I meet with people, do some workshops, talks and discussions. What do you think I should do and do you think you could help me and the collective during this trip in anyway with contacts, promotional help or other ideas of what to do whilst I’m there?